Kirk Hopper Fine Art is excited to announce our upcoming exhibition New Work by artists Alejandro Diaz-Ayala, Sergio Garcia, Luke Harnden, and Nicholas Mathis. New Work will be a painting-based exhibition conceived of and curated by the artists, with only minor guidance provided by the gallery where requested. Each artist will present work specifically selected to fit in with the group's collective vision for the exhibition. Diaz-Ayala's work has slowly evolved from a more formal representational style to a less restrained approach in painting. While his interest in portraits and still lifes is still prevalent, Diaz more frequently interrupts his subject, injecting pop and iconic imagery, mixed media, and colorful abstract brushwork onto his otherwise classically rendered picture planes. This is done to create tension in the work that Diaz finds both beautiful and uncomfortable. Born and raised in Dallas, Garcia began his career in graffiti, eventually transitioning to making work in a multitude of forms including painting, prints, and sculpture. Much of Garcia's work has been influenced by the icons of his adolescence such as tricycles, bubble wands, and sneakers, that he reinvents using unconventional materials and forms, but a touch of whimsy can be found in all of his pieces. 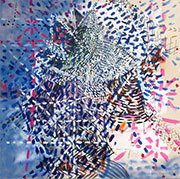 Garcia's artwork has been exhibited nationally and internationally, including in Dallas, San Francisco, and New York. Luke Harnden is a Dallas-based artist who uses a variety of different mediums for his interactive and optically engaging works. He says of his work, "images are derived from a dual process of realistic representation and haphazard spontaneity. This contrast of physicality and unconscious mark making allows an array of dimensions to exist on a single surface. Their meaning is elusive and non-concrete until independent perspective creates connections with its symbols. The painting itself is just a catalyst for dialogue." Mathis's work is driven by his interest in memory. This interest comes from his experience with color synesthesia, a neurological phenomenon that ties a person's perception of numbers, letters, and other entities with the experience of colors. For example, a person with color synesthesia while reading the letter A might also see it as the color red. Mathis uses his experience with color synesthesia to explore and record memories, and his reactions to his memories that are also inexplicably rooted in color relationships. Mathis has shown in Dallas and New York. This is his first exhibition with Kirk Hopper Fine Art. Nicholas Mathis, Untitled, 2014, mixed media on canvas, 60" x 60"